One of the most popular fruits in the world is the pineapple. It is one of the most sought after fruits in the world after originally having its humble beginnings in Paraguay, South America. It was originally not well known until Europeans brought it to shores from their various travels and adventures. It boasts a considerable number of health benefits including being low in calories but containing a number of vital vitamins and minerals in its properties. It is an excellent source of vitamin C and also contains a small amount of vitamin A, which contains important antioxidant properties vital for the functioning of the human body. The health benefits also reported by consumers of the fruit include its digestive benefits and also anti-inflammatory qualities. Individuals with a rich diet in vitamin C fruits, who consume fruits like the pineapple are less likely to suffer from heart disease, cholesterol, and other immune related illnesses. Vitamins C rich fruits like the pineapple are also an excellent source to turn to if suffering from a common cold or flu on a regular basis. The pineapple is a versatile and flamboyant fruit which can be enjoyed in various ways. The best pineapples have a nice smell that is fragrant at the end of the stem. Some of the best recipes with pineapple include adding it to your breakfast smoothie. Why not take some apple, carrot, ginger and add two slices of fresh pineapple creating the perfect breakfast smoothie rich in vitamin C and the perfect way to start your day. For lunch, it can be easily added to your existing lunch menu by being a trusted sidekick snack. Why not add in some pineapple to your pizza topping when you are not having a healthy lunch or even better add it to stir fries or wild salads giving you juicy flavor to your favorite meals. Some of the best recipes with pineapple are found at the dessert table. 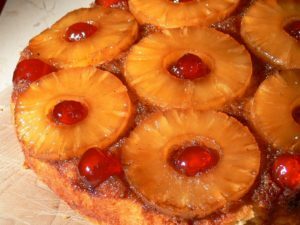 Why not take the trusted pineapple and make a lovely old fashioned pineapple upside down cake or my personal favorite banana and pineapple cake. It can also be enjoyed in sundaes, with ice cream or any other cake. For dinner, it is going exceptionally well with meat. For example, you can enjoy its flavor best with grilled pork chops by creating a culinary delight that blends the texture of the meat perfectly with the moistness of the pineapple. It is also excellent with fish particularly salmon and shrimp. The whole family can also enjoy it with wild rice salad. This popular fruit continues to be an important part of our diet and by adding it to modern and classic dishes you can experience the health benefits and add some juicy flavor to your meals. The secret to making the most out of the pineapple is making the most out of its versatility, you can literally add it to just about anything or enjoy it on its own for its flavor.